Taoiseach Leo Varadkar has urged all sides in the rail dispute to engage with the Workplace Relations Commission or the Labour Court to try to bring an end to the ongoing strike action. Mr Varadkar said the dispute, like all strikes "will be resolved in the normal way using the auspices of the State, through the Workplace Relations Commission and if needs be the Labour Court". He said: "I'd encourage both unions and the management to engage with the WRC or the Labour Court and let’s have this strike settled". Rail services around the country are at a standstill today, as Iarnród Éireann staff hold their second 24-hour strike over pay. More than 150,000 people are being forced to make alternative travel arrangements, while the stoppage will also hit company revenue and workers' wages. There has been no sign of any breakthrough that might bridge the gap between the two sides. Minister for Transport Shane Ross described the strike as unnecessary and also urged unions and management to enter talks. On his way into Cabinet this morning, Minister of State Patrick O'Donovan urged both sides to get back around the negotiating table. Today's stoppage is the second of five scheduled by unions in pursuit of a no-strings attached pay rise of 3.75% a year. However, the Iarnród Éireann insists the union claim would cost €43 million over three years and push the already vulnerable company into insolvency. 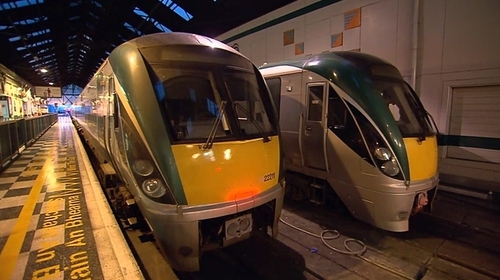 Iarnród Éireann Chief Executive David Franks has warned staff it could become a prolonged dispute, which would be costly for the company, staff and customers alike. Mr Franks has urged unions to return to the Labour Court to resolve outstanding issues. However, there is no sign of any breakthrough and unions have not ruled out an escalation of industrial action in the run-up to Christmas. SIPTU representatives have called on Iarnród Éireann management to desist from sending letters to workers which could be perceived as threatening their livelihoods. Divisional Organiser Greg Ennis said members received a letter yesterday from Mr Franks "which many saw as threatening their livelihoods and the future of the company. "Such an approach has only strengthened the resolve and commitment of our members to continue their industrial action until all sides agree a just resolution," he added. SIPTU and NBRU members picketing outside Ceannt Station in Galway said they were disappointed at a lack of intervention by Minister for Transport Shane Ross. Speaking on the picket line, train driver John Burke said it appeared Minister Ross was more interested in "Manchester United and North Korea" than in dealing with the disruption caused to thousands of would be rail passengers. Mr Burke said the unions involved did not want to cause such upheaval to travel plans but felt they had no option but to embark on strike action. He said it was too early to say if the industrial action would be stepped up in the coming weeks and called on Mr Ross to take some action to bring about a resolution to the dispute. Mr Burke said both sides were "miles apart" at this stage and some intervention would be needed to bridge the gap. While Bus Éireann inter city services to and from Galway are running as normal, drivers are collecting and dropping passengers outside the boundaries of Ceannt Station. Intending passengers are being advised to go directly to Fairgreen Road behind the station for all departures. All arrivals into the city will stop at that location until this evening too. In the midlands, Bus Éireann said there is additional pressure on services, but extra resources have been laid on to meet the extra demand. With the cancelation of early morning trains from Athlone, private bus operators reported full service demand. Extra services have been laid on again in the Laois and Kildare area to meet the demands in the commuter belt. The Corporate Communications Manager with Iarnród Éireann Barry Kenny has said strike action would cost employees dearly. Mr Kenny said the alternative to this was to refer the matter back to the Labour Court and he urged unions to do so. The General Secretary of the NBRU Dermot O’Leary has apologised to those affected by today's rail strike. Mr O’Leary said the majority of workers do not want to be on the picket line but that Iarnród Éireann did not deem increased revenue and commuter numbers important enough to offer workers a credible pay offer. Mr O'Leary said that the union would keep the situation under ongoing review and that the action "could be ramped up". However, he said he did not envision any situation where other transport companies could become involved and that there was a broader question in terms of funding that needed to be addressed. What are the striking workers looking for? Unions are seeking a "no-strings attached" increase of 3.75% a year for three years. However, Iarnród Éireann insists that all pay rises are out of the question unless the cost is offset by efficiencies and work practice reforms. The company notes that it is carrying €160m in accumulated losses and is forecasting a further shortfall of €1m for 2017. It says conceding the union's claim, which would cost €43m over three years, could push it into insolvency. The third strike day is scheduled for 14 November - the day of the Ireland-Denmark World Cup play-off.